In this second blog about OData V4 code based implementation I want to show how to enable create and updated capabilities in the demo service, so that it is possible to perform the following actions. The data provider class contains the generic implementation of the basic interface methods for creating, updating and deleting data. These are the following methods. How to create such useful links is described in Thomas Fiedlers blog. We start with the method /iwbep/if_v4_dp_basic~create_entity which is for example called if a client accesses an entity set with a Post request, for example Post ….<service root>/Salesorder. As we can see the generic part of the coding is fairly small compared to the read operations. The coding basically checks which entity set has been accessed using the method io_request->get_entity_type. The name of the entity sets of our service have been defined in the interface zif_e2e001_odata_v4_so_types. io_request->get_entity_type( importing ev_entity_type_name = lv_entity_type_name ). The entity type specifc methods create_salesorder and create_salesorderitem both start with a definition of entity type specific data types that will hold the data being returned of the newly created entity and the data that has been provided by the client via the http payload. With this todo list we can check whether our service implementation has to retrieve business data from the payload of the request. io_request->get_busi_data( importing es_busi_data = ls_salesorder ). Next is to check whether the payload contains all properties that are necessary to create the new entitity. If the payload does not contain all properties of the entity type the SAP Gateway framwork sets the flag ls_todo_list-process-partial_busi_data in the todo list. Since the sales order entity type contains properties that are being calculated after creation of a sales order (for example the creation date) the partial_busi_data flag will always be set. So we have to check for the properties that are mandatory when calling our BAPI seperately. If a mandatory property is missing an exception is raised telling the client that either the property Customer or TransactionCurrency is missing. lv_names_of_missing_props = 'Customer or TransactionCurrency'. Now we can call the Bapi BAPI_EPM_SO_CREATE to create a new sales order. If an error occurs the return message of our Bapi is added to a message container and sent back to the SAP Gateway framework by raising an exception. if lt_bapi_return is not initial. loop at lt_bapi_return into ls_bapi_return. If everything worked fine we can read the data of our newly created sales order from the CDS view that we have created and send it back to the framework using the method io_response->set_busi_data.
" Read data again and set the response. As a final step we have to inform the framework which tasks our implementation has taken care of. For creating a salesorder item we have to use the Bapi BAPI_EPM_SO_CHANGE. The generic implementationpart of the method /iwbep/if_v4_dp_basic~update_entity is similar to the basic create method. After checking which entity set has been accessed the entity set specific update method is being called. First again entity type specific and genric data types have to be defined. In addition to the data types that are based on the CDS views we have to define data types to send the request payload to the Bapi and the structre that is used to tell the Bapi which fields have been provided by the caller. lo_message_container type ref to /iwbep/if_v4_message_container. The todo list can contain the following flags: process-busi_data, process-key_data and process-process-partial_busi_data as well as return-busi_data. The process-partial_busi_data flag will not be set most of the time since the recommended method for updating data in OData V4 is the Patch method. The business data is moved from the structure ls_salesorder to the Bapi specific data structure ls_salesorder_rfc and the appropriate fields in the corresponding x-structure ls_salesorder_x_rfc.
" Update single entity using classic API. loop at lt_bapi_return into data(ls_bapi_return). A new thing in ODat V4 is that an update request will contain the data of the updated entity by default unless being told otherwise by setting the Prefefer header return=minimal. We can check this using the flag ls_todo_list-return-busi_data and return data using the method io_response->set_busi_data if being requested to do so. The following screen shot shows an example where no response is sent since the Prefer header return=minimal is used. In the genric part we are checking in which entiy set an entity shall be deleted like it is done in the methods /iwbep/if_v4_dp_basic~create_entity and /iwbep/if_v4_dp_basic~update_entity. 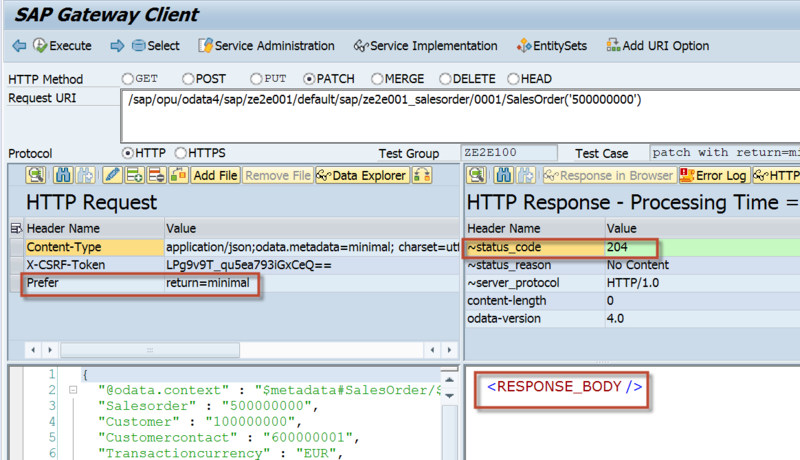 Here the entiy set specifc methods delete_salesorder or delete_salesorderitem are called. The delete methods are much simpler than the create and update methods. There is only one todo flag process-key_data. If the deletion of the sales order fails the bapi return message is sent to the client via raising an exception using the exception class.